Who says salads have to be boring? 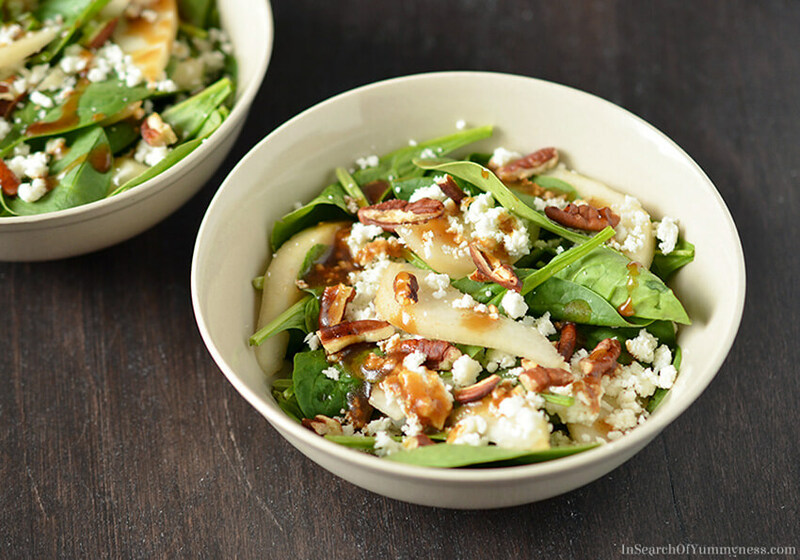 This spinach salad with pears, pecans and goat cheese is one of my favourites! Lately I’ve been feeling like I should apologize for neglecting my blog for the past year… because I really have neglected it. It’s not that I wanted to, but, well, life happened. If you’ve been following my blog for a while, you might know that I had to leave my job at the daycare a couple of summers ago. It took me about 8 months to find decent freelance writing gig, and aside from that my only income was from this blog. I was desperate to increase my income from my blog. If you’ve ever done freelance work you’ll know that it can be fun and rewarding, but your income is really inconsistent. I needed to make at least a part-time income from my blog! So I signed up for every e-course, webinar, e-book and online course that I could find. Some were free and had useful information, others were expensive and a total waste of money. But I felt like I was investing my time and money into building a business for myself, so it was ok if I was spending a lot of time absorbing all that content. Here’s the thing though. Reading and learning is important, yes. But learning the theory of things isn’t the same as doing them. I was suckered in by the promises of “double your email list with this webinar” and “learn how I made six figures from one blog post”, because I thought there had to be at least a nugget of useful information in there that I could apply to my blog. But I was missing the point. The purpose of a blog is to share content, and I wasn’t sharing a damned thing. Somehow over the course of a year I convinced myself that I couldn’t create content for myself because I wasn’t blogging “the right way”. Articles, courses, and even my well-meaning blogging friends convinced me that I was doing it all wrong because I didn’t have a distinct niche, I didn’t have a target audience, etc. etc. etc. I continued doing sponsored posts (they pay the bills folks), and creating content for clients in my freelance work, but I had lost the will to blog for myself. I finally had someone tell me that it’s my blog, and I should just do what I want with it. Which sounds so simple, but I really had lost sight of why I started this website in the first place. It was just what I needed to hear to joggle my brain, and release me from the funk I was stuck in. I’m in a position now where I’m working two (new!) part-time jobs on top of freelancing and blogging, so I don’t have to rely on my blog for income. Not that it wouldn’t be great to have extra income… I’m not exactly rolling in dough right now (and I’m probably going to be living with my parents forever), but it takes some of the pressure off. So despite the fact that I’m busier now than I think I’ve ever been (maybe excluding the time I was working in television), I’m going to try to resurrect my poor, neglected blog. I’m staring with something easy – a beautiful spinach salad recipe that I have been loving lately. I hope you try making this salad, and if you do let me know what you think of it in the comments below! 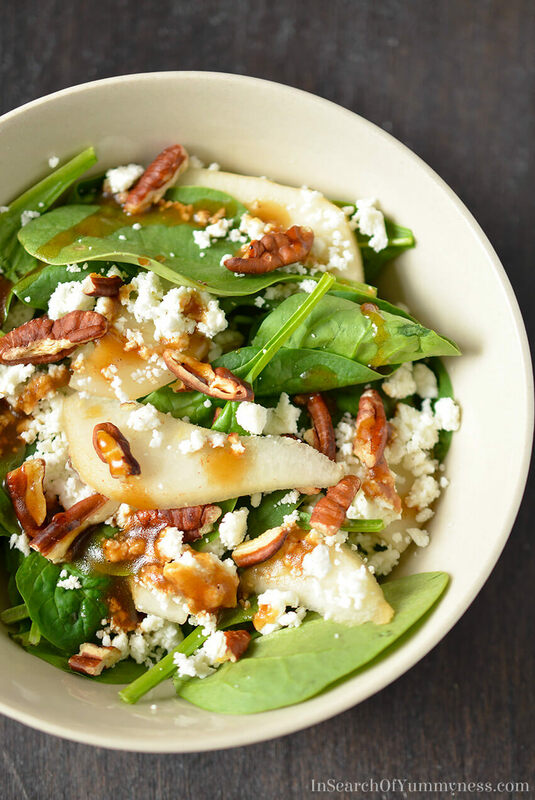 This delicious spinach salad gets crunch from toasted pecans, creaminess from goat cheese and sweetness from juicy ripe pears! Place all ingredients in a bowl and whisk until combined. Alternatively, you can add the ingredients to a mason jar, screw the lid on tightly, and shake to combine. Place spinach and pecans in a large bowl. Add a few spoonfuls of dressing, then use your hands to toss the salad to combine the ingredients. 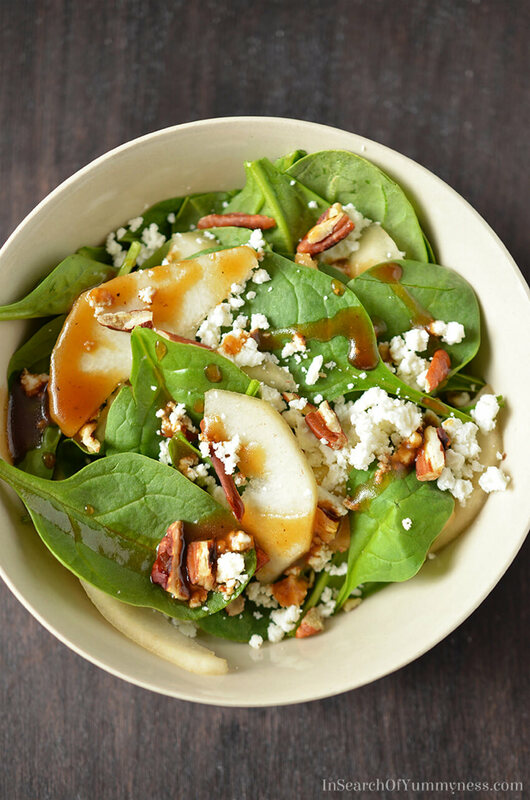 Add the pear slices to the salad, and toss again, gently. Divide the salad among serving plates, and top with goat cheese and extra dressing as needed. Serve immediately. It is great that you are following your heart and writing what is important to you. It definitely comes through in your blog. All else follows when you are doing what you love! This is so important – too much of the advice out there is geared toward a cookie-cutter approach to blogging. I’m glad you’re re-focusing on your interests, because I really enjoy your voice. Great post! Thanks Teresa, I’m hoping to get back on track in the coming weeks! This looks so good, Shareba! I’m in love with the flavour combo of pears, cheese and nuts! Thank you for posting! Thanks Colleen, it’s seriously delicious! I think part of it is curiosity too. Like, well these people say that this course made a huge difference for them, so maybe I’ll try it too… It totally makes it a chore, and not fun. I’m glad you’re enjoying blogging again too 🙂 Thanks for pinning! I’m so glad to see you blogging for yourself again! It’s so easy to get caught up with all the things that you supposedly should be doing or shouldn’t be doing or should do differently… but in the end, that just means you end up with a generic blog that looks just like everyone’s else’s, and there’s no satisfaction or joy in that. You do you, girl. Especially if it means more delicious salads like this one! It would be great for a work lunch! Thanks for stopping by Leslie!